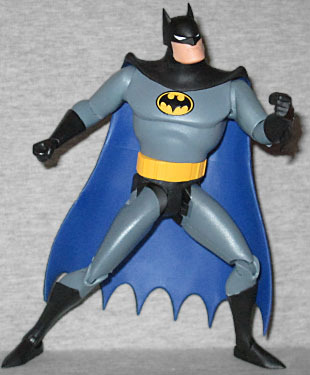 There's already been one Batman figure, but it was based on the "New Batman Adventures" look (ie, the Season 4 redesigns). It took more than a dozen figures before we got one based on the classic version from seasons 1-3. 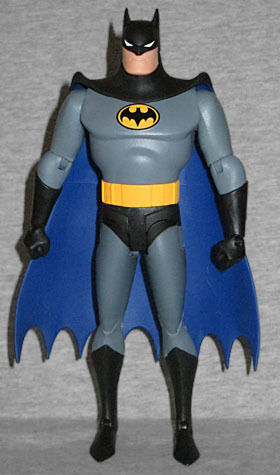 For a lot of people, this is "the" Batman - the one their brains default to when they think about the character at all. And with good reason! While Joel Schumacher was making live people act like they were in a cartoon, Alan Burnett was making cartoons feel like a real world. A lot of the episodes borrowed their plots from acclaimed comics, and even those that didn't stayed true to the best parts of the character. Batman: the Animated Series was the only thing that kept DC and Warner Bros. from squandering all the goodwill and interest created by Tim Burton, so if anyone thinks of this Batman above all others, more power to them. Prior to Bruce Timm being given free rein to redesign the characters, they were were more realistic. Oh, they were still simplified and streamlined, but they had more natural human proportions - thicker legs, smaller torso, etc. The head alone is not that different from the previous toy, but sculptor Irene Matar made sure they both look unique. The work on the body is excellent, too. There are more details on this Batman than the last one, but they're still soft and rounded. The edges of his boots, gloves and even his trunks are all sculpted in, but the true surprise is that the symbol on his chest is fully sculpted, too! 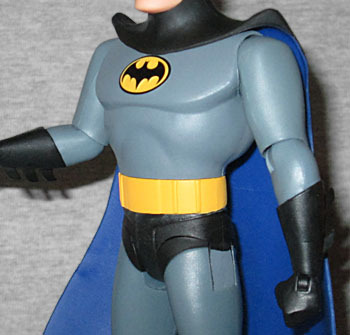 His utility belt is the capsule style, not the pouches - is it not weird that when Bruce Timm made everything about the bodies simpler, he also made Batman's belt more complex? The articulation is the same here as it is on the other figures: balljointed neck, swivel/hinge shoulders, elbows and wrists, swivel waist, H-hips, hinged knees, and swivel/hinge rocker ankles. The days of these figures having weak, breakable joints are behind us, but DC Direct has also done away with the visible pins in the hips. This really is a superior Batman overall (though we do wish he had a replacement cape, like Robin had). If there's one downside, it's that this re-release does not come with as many accessories as the single-carded release (#13, for those keeping track). 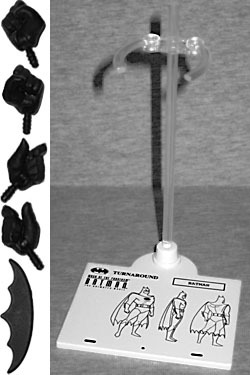 Although we get the usual display stand, an extra set of hands, and a batarang, the solo version also came with another set of "holding" hands and two versions of Batman's grapnel launcher. Why not include those here? The money was already paid to tool them, and that would increase the value for everyone. This also would have been a nice opportunity to make an unmasked Bruce Wayne head, or give him some battle damage, even if it was just painted on. Something, anything so this was not just a copy of the existing toy with fewer accessories. Either way, it's not the inclusion of Batman that's selling this set. In fact, the reason I never bought figure #13 was because DC had already announced this set was coming, featuring both Batman, and his mysterious foe, the fearsome Phantasm! Mask of the Phantasm was originally planned to be a direct-to-video release, but WB decided to put it in theaters. Because of that change, the animators had to scramble in order to change the aspect ratio from 4:3 (TV sized) to 1.85:1 (widescreen); there also wasn't time to adequately promote the film, which is why it was considered a flop at the time of its release (and was also why the future DCAU films only went DTV). As we said several paragraphs ago, many BtAS episodes were based on the comics, and Mask of the Phantasm is no exception: it's a blend of "Year One" and "Year Two," with Phantasm standing in for The Reaper. The idea was to make Phantasm look like the Ghost of Christmas Future - thus the mask that looks like a skull and the big ragged hood. Phantasm was voiced by Stacy Keach, whose already-deep intonations were mechanically altered to have a sinister echo, suggesting the mask is metal. The "mouth" is three vertical slits, and there's a triangular nose hole. Even by Batman standards, Phantasm is not a colorful character. You've got grey for the hood, cape, gloves and boots, white in the eyes, and then everything else is solid black. There isn't even much of a sculpt on the body, so that there won't be any wayward lines to catch the light and make the body look more detailed than it should. The wrinkles on the hood are about the only thing we get, but they look terrific. We've seen some custom Phantasms made from Captain Cold, because of their similar shoulder coverings, but it's nice to finally get a real, official version. 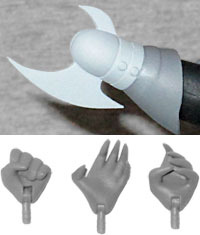 Phantasm's signature weapon is a bladed gauntlet, but since it's constantly worn, it doesn't really count as an accessory. We do get our choice of three left hands, however - fist, holding, and relaxing. What we don't get here is the same thing we didn't get for Batman: an unmasked head. Maybe they were worried about revealing spoilers (this time). 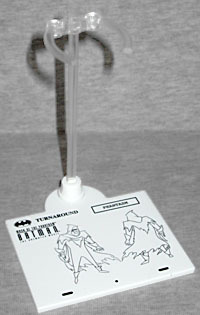 We also get another doll stand, this one with a turnaround of Phantasm on it. No surprise there. In addition to all the same joints Batman had, Phantasm also has swivels at the top of the boots and gloves. Why those? Well, the right arm is clearly so the blade-hand can be more easily turned for cool poses, but the left arm is duplicated by the wrist, so it's really not necessary. 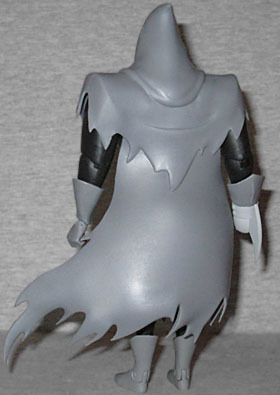 The cape and hood are molded from a single piece of PVC that plugs into the figure's back, which means that the head just moves around inside it, rather than turning the hood with it. Knowing that this two-pack was coming, I didn't bother with the single-carded Batman. Fortunately, the accessories this one is lacking aren't too essential, but DCD really could have done more to make it interesting. 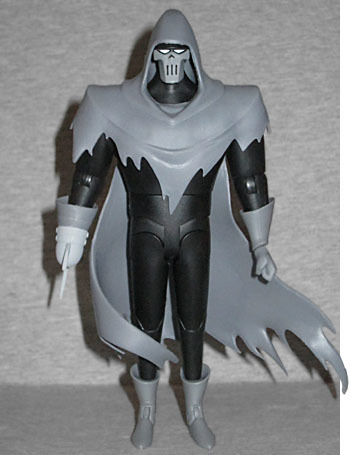 And considering the Phantasm accessory we didn't get, I wouldn't be too terribly surprised if they did a second version in the future, this one with an alternate head. If we'd gotten those extras here, this would be an amazing set - as it is, it's "just" a good one.